Honda Malaysia is unwavering in its commitment to ensure that all affected Takata airbag inflators are replaced as soon as possible for customers’ safety, and continues to emphasise the importance of replacing the affected Takata airbag inflators immediately. The company will also continue to work closely with the Ministry of Transport (MOT) and Road Transport Department (JPJ) to further emphasise the urgency to replace affected Takata airbag inflators. As at September 20, 2018, Honda Malaysia has completed more than 236,800 units of Takata driver front airbag inflator which translates to 90% completion ratio. The total number of Takata driver and passenger front airbag inflator replacements completed is at more than 496,400 units or 84%. Honda Malaysia appeals to affected Honda customers who have yet to undertake the replacement activity to urgently replace their affected Takata front airbag inflators as it may deploy with excessive internal pressure when activated. The airbag inflator casing might rupture which may result in injury or fatality of the driver and passenger. Stock availability for both driver and passenger front airbag inflator replacement is at 100% for all models. The replacement of the affected Takata airbag inflators is FREE OF CHARGE and any cost related to Takata airbag inflators replacement will be borne by Honda Malaysia. A total of 94 Honda authorized service dealers nationwide are on standby to prioritise affected Takata airbag inflators. Customers are highly recommended to make an appointment with the Honda authorized service centre nearest to them to ensure priority for replacement activities and avoid delays or setbacks in replacing the Takata airbag inflators. To provide easier access to replacement activities, Honda Malaysia also made available more locations for customers to undertake replacement activities including dedicated Mobile Hubs at selected shopping malls, as well as at selected PETRONAS stations. 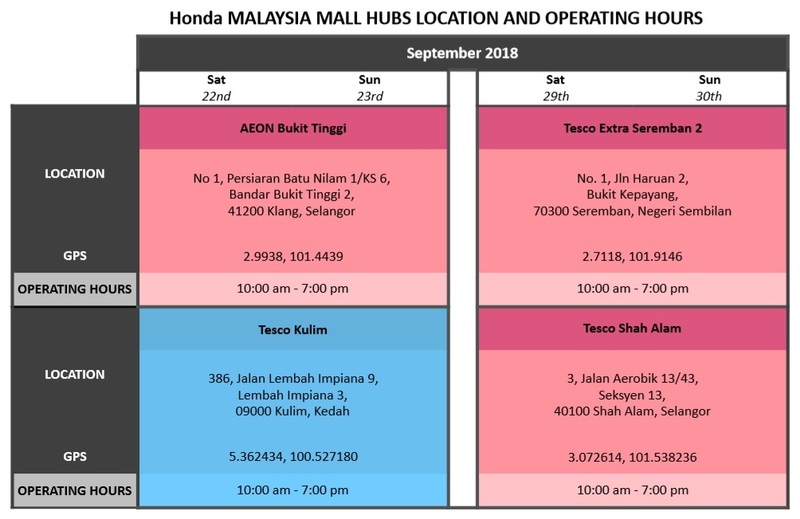 Replacement activities at the Mobile Hubs and selected PETRONAS station hubs do NOT require advance appointment as walk-ins are welcomed at these locations. Honda Malaysia also has Mobile Teams from Honda authorized dealers who will be operating in selected areas. The associates in the Mobile Teams will be in Honda uniforms and have with them an authorization letter for customers’ convenience in recognizing the team. Customers may request to view their Honda Identification Tag or contact the Honda Toll Free number 1-800-88-2020 for further confirmation when approached by the Mobile Team. The door-to-door Mobile Teams will also make arrangements for replacement activities on-site where necessary for customers who are genuinely unable to go to any nearest dealer or the replacement hubs. Honda Malaysia continues to extend the replacement of Takata airbag inflators to parallel imported Honda vehicles, which were not sold by Honda Malaysia. Owners of parallel imported Honda vehicles are advised to contact Honda authorized dealers to check on the status of their vehicles and if affected, to make arrangements to replace their airbag inflator as soon as possible. Cost of parts and labour for the airbag inflator replacement will be borne by Honda Malaysia and is free of charge to the owners. Honda Malaysia continues to emphasise the importance of replacing the affected Takata front airbag inflators and implores the owners of the affected Honda vehicles to do so as soon as possible. The company also urges all Honda vehicle owners to register their vehicles at the nearest dealer so that any information sent can reach the owners adequately. 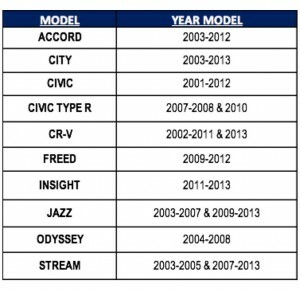 Honda Malaysia would like to affirm that the current selling line-up of Honda models do not have the same type of Takata airbag inflators as previous models affected in the recall. 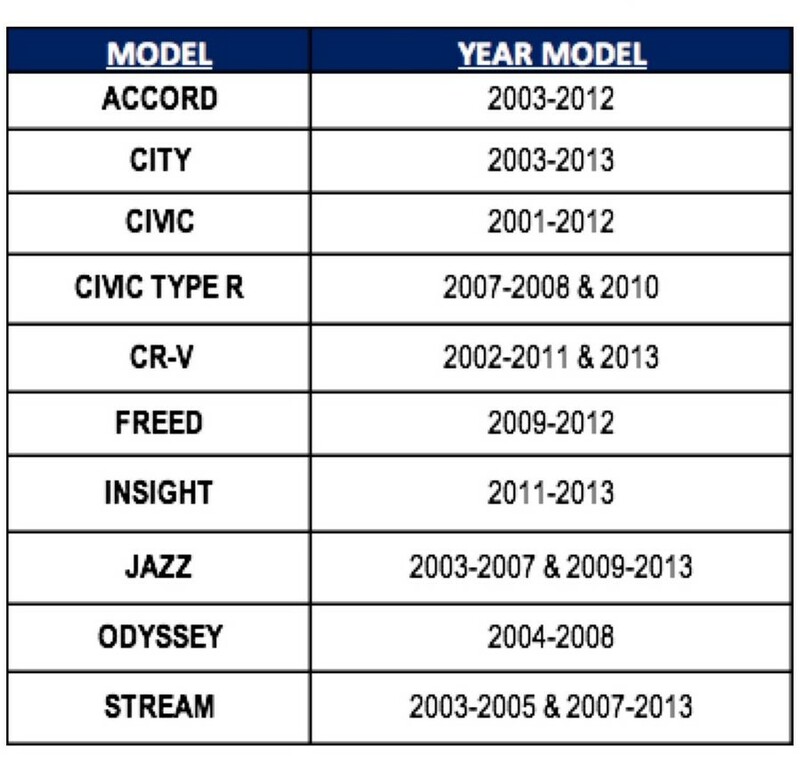 All current selling Honda models are not affected.